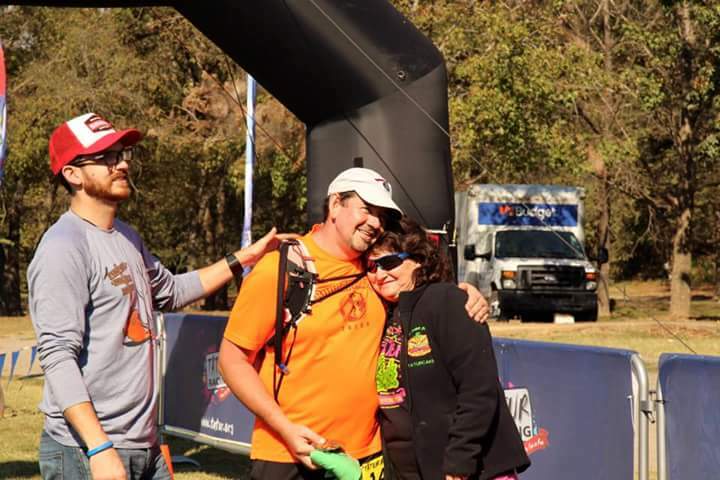 Each year our founding RD, Ken ‘TZ’ Childress writes a race report. He also publishes updates for coming races and other run related items on his blog at www.TrailZombie.com. 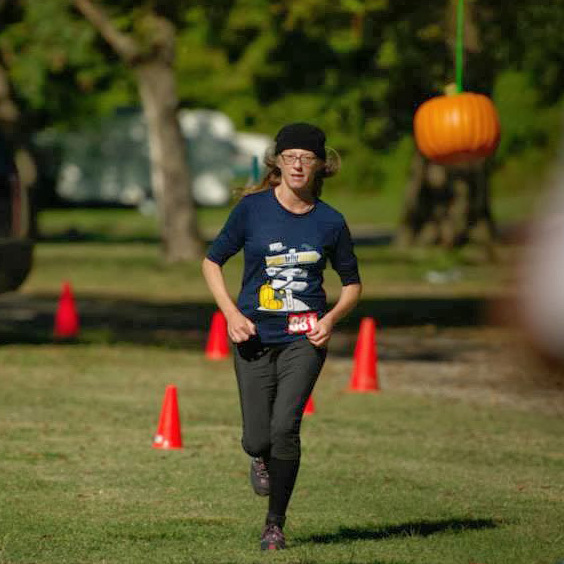 In addition to TZ, other runners have published articles and photo libraries from Pumpkin Holler Hunnerd. 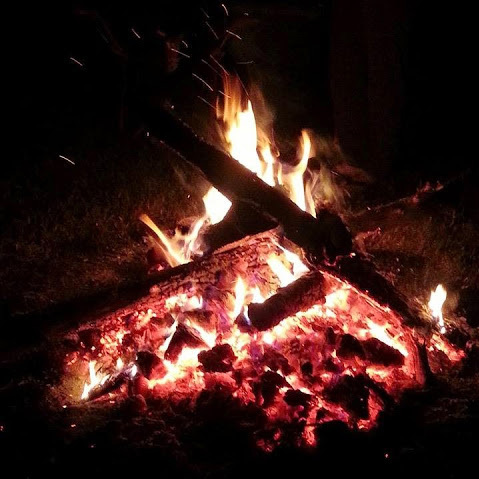 We hope you enjoy reading these as much as we enjoyed creating these memories. 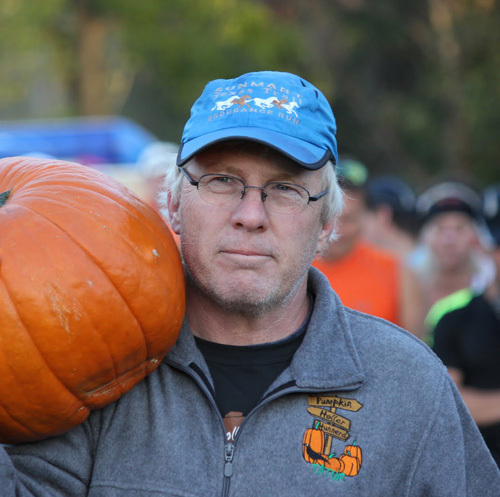 Let us know if you have a Pumpkin Holler race report you want listed here. This year brought another record crowd out to Eagle Bluff Resort to our SIXTH RUNNING of the Pumpkin Holler Hunnerd. our numbers increased in the 25K, 50K, and 135-mile events. The 100K and 100-Mile attendees were off a little, but a lot of 135ers stopped at 100 miles or 100K. 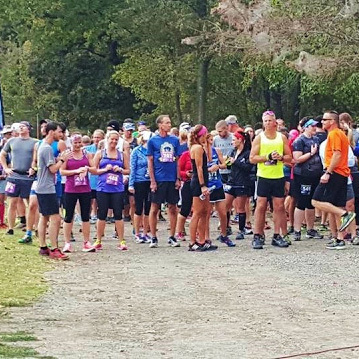 The 10K was set aside in lieu of a 10 Mile, which is a better fit for the course... Read the rest at the link below. Pumpkin Holler Hunnerd started with a hectic week – teaching, meetings, then a rush to the airport, delayed flights, and landing in Tulsa, Oklahoma at 1:00 a.m. on Friday, checking into an airport hotel, desperate for a few hours of rest before the endeavor ahead. The story is not new; rather, it’s a depiction of the typical pre-race scenario of the last few years of my life. Rush rush rush, arrive, race, rush rush rush, return. 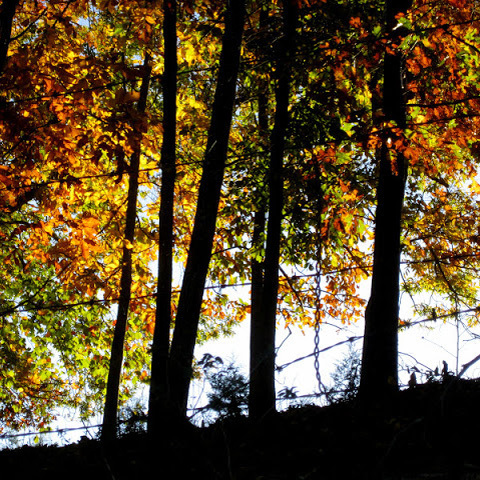 It's taken a few days to collect my thoughts after the fifth running of the Pumpkin Holler Hunnerd. We had a great year with nearly 100 more runners than last years record crowd. 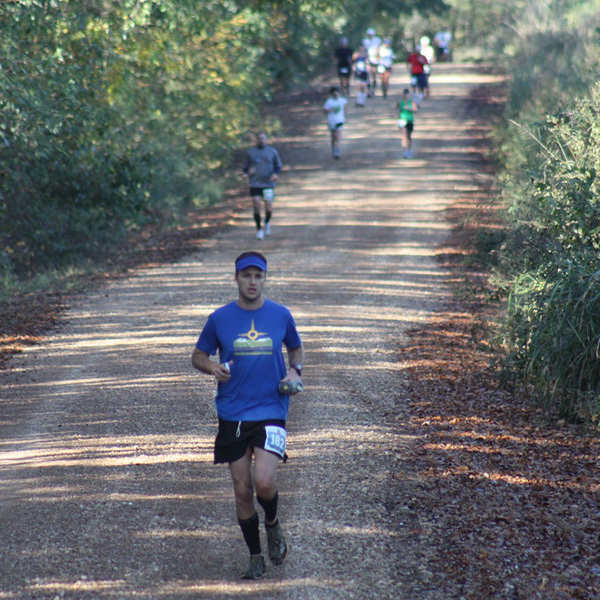 Most were in the 50K and 25K, but all distances had an increase in entries. 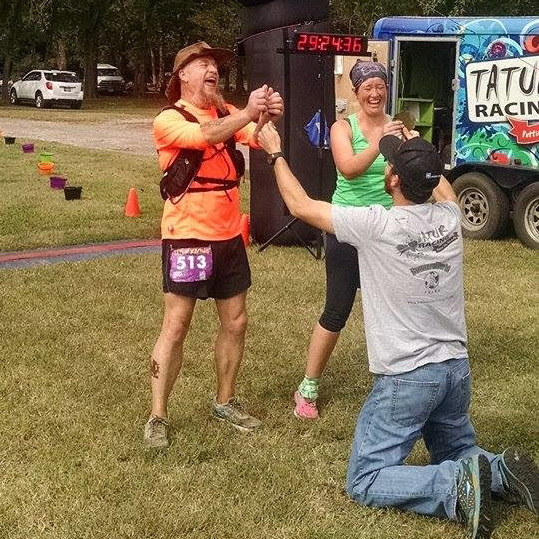 This is TATUR's premier race, and we've had runners from over 30 states run with us. Stormy & Dana are welcome sites at the finish line for a 100 mile 'jog' (more like walk). 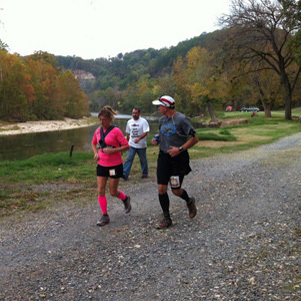 The Pumpkin Holler Hunnerd race is hosted near Tahlequah Oklahoma along the Illinois River and surrounding the Nickel Family Nature Preserve. Even after a week it is still surreal and I only know it happened based on pictures on Facebook and the buckle and shirt sitting on my nightstand. A person’s first 100 mile run probably doesn’t count. Nobody believes it. Finishing seems like a fluke or a dream. This is my second 100 mile run and it is becoming a bit more real now. Words cannot describe this race adequately. Pictures cannot capture the true stories behind the smiles on runners and volunteers. 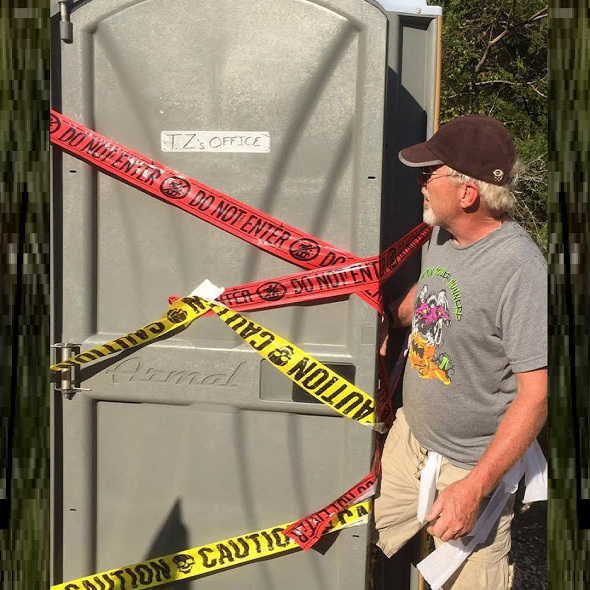 Founding Race Director Ken "TZ" Childress provides a walk through history and how he stumbled upon a little slice of heaven that he now wants to share with you at the Pumpkin Holler Hunnerd. Read over his 2014 look-back and race report. I've been sitting here staring at a blank screen trying to decide where to start. I told my friend Monica I didn't know where to start and she told me to start with the fact that I'm a badass. So, here it is. I ran 103.7 miles on a hilly, rocky road. I'm a total badass. For those that don't want to read a long, boring blog, let me sum it up for you. I had a plan, I executed it. I smashed that pumpkin! My journey began at 8:00 am on Saturday. 29 hours and 24 minutes later, it was over. It is amazing what a person can go through in that span of time and over that many miles. We all lined up and it seemed like people were fighting to be in the back. At a lot of races people want to be in the front. Not this one. I think most of us knew we had a long day ahead of us, and no one wanted to go out too fast. We took off and as we were running through the campground where the start/finish is, I got a little choked up. I've wanted to run 100 miles for such a long time. I've worked so hard this summer, and it was finally going to happen. The course consisted of an 8 mile out and back and 3 loops of 31.9 miles. The total length is 103.7. Nasty trick, right? 3.7 miles may not seem significant, but I'm here to tell you, it is. The third running of the Pumpkin Holler Hunnerd has came and gone, and this year was amazing. We had a few less entrants in all four distances which was a little disappointing, but the enthusiasm was over the top. Eagle Bluff hosted us again, and as long as Comb's Bridge is still in service, we'll have it here. This is possibly the most scenic stretch of the Illinois River. Brian and I camped Thursday night, and were up at the crack of dawn to get things ready. The porta-potty dude came at 9:30 instead or 8-ish, so we started work on the loop with a big time deficit. 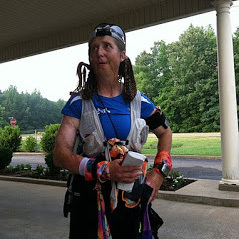 Friday night, we met at the Presbyterian Church in Tahlequah for the pre-race dinner/packet pick-up/race briefing. Brian and I had been on the course all day, setting up the start/finish line, and aid stations. We must be getting better, because we both made it to the dinner early. 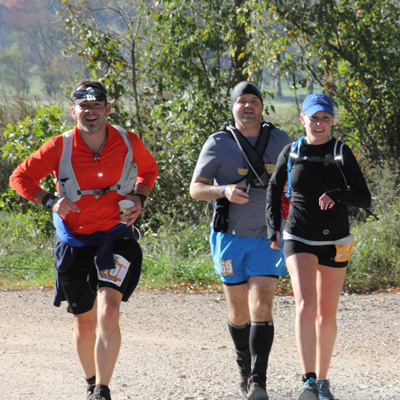 Check out this 50K race report from Brian Desmarais, a blogger friend who ran the 50K at Pumpkin Holler. Brian ran a 5:38, a very respectable time. Brian has a great blog called BikeRunBeer and upon reading just a page or two, you'll agree that he is a great writer and photographer. 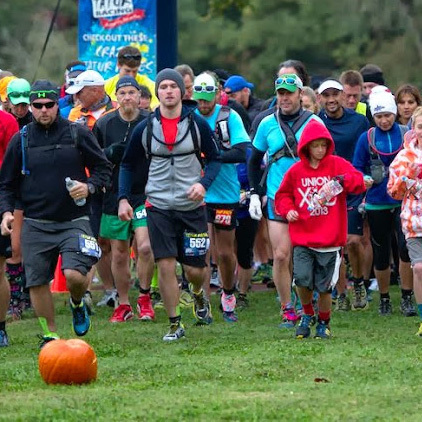 Read a great Pumpkin Holler Hunnerd race report from my buddy Russell Bennett, the Iron Horse. 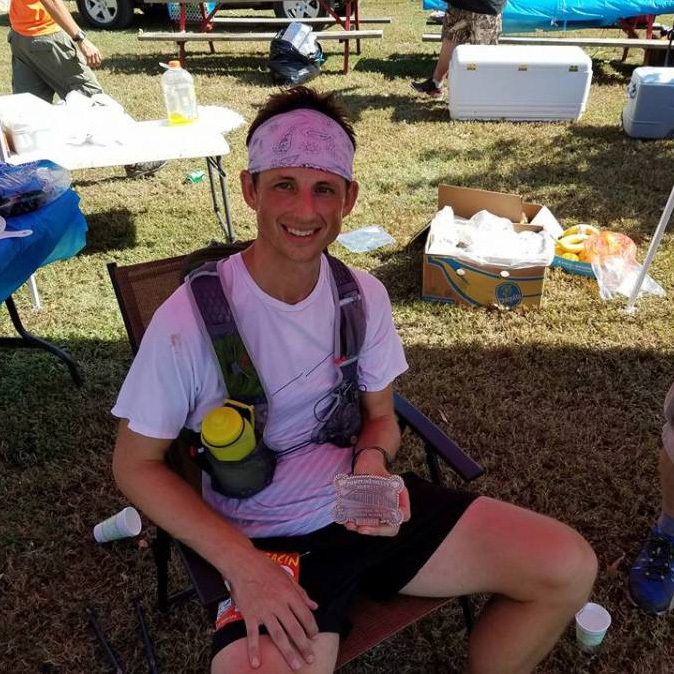 Russell wrote his report on his first 100 mile run, and it was published by our friends at Endurance Buzz!! Congrats Russ, and thank you David Hanenburg for publishing Russell's report. 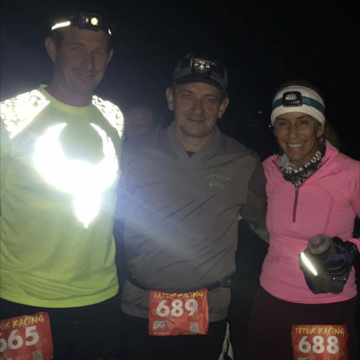 Tulsa, Oklahoma runner Russell Bennett decided to experience his first 100 mile adventure at the Pumpkin Holler 100 in Tahlequah, Oklahoma. Russell went on to earn a finish in 28:35:53! Enjoy as he shares his journey.